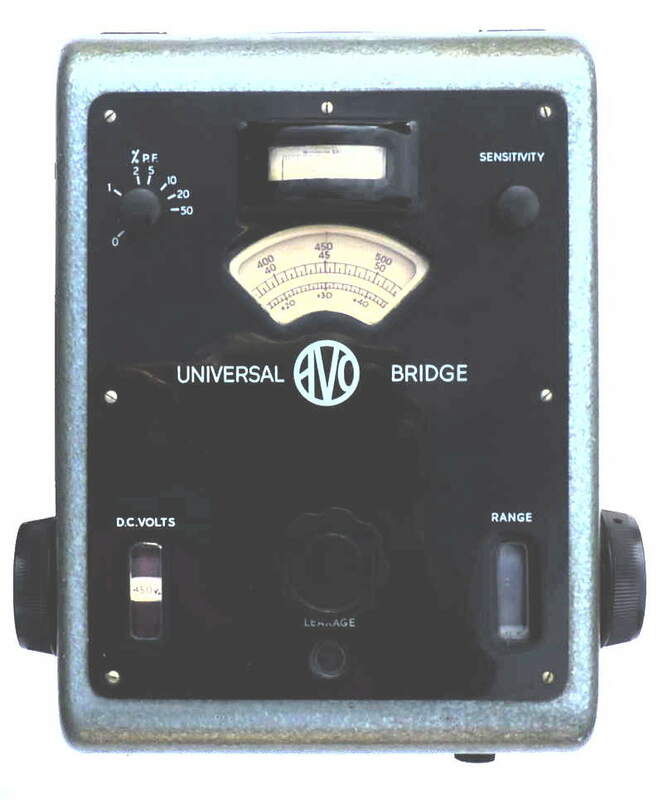 Avo Universal Bridge (1951 model) This one dates from 1955 and can measures Resistance from 0.5Ω to 55MΩ, Capacitance from 5pF to 55µF and Inductance from 50mH to 550H. It can also be used to test capacitors for leakage at 25V, 50V, 150V, 250V 350V and 450V.﻿ Mains operated 100 to 260V 50/60 Hz. The instrument consists basically of a bridge network fed from a screened winding of low distributed capacity on the mains transformer, together with a variable sensitivity valve voltmeter as a balance indicator. The bridge has standard arms of resistance for resistance measurements, and capacity for condenser and inductance measurement, a Maxwell network being used in the latter case. The variable calibrated arm is a linear variable resistance, whilst fixed resistive multipliers, together with the unknown, complete the network. An approximate phase balance is provided by a variable resistance connected either in parallel or in series with the capacitance standard, dependent upon the range being used. This instrument is one of a number given to me by Martin Harrison which belonged to his father who was a a Chartered Electrical Engineer. He collected both old electrical test equipment and due to his name (John Harrison) old clocks. Martin thought his father would have been pleased with his items been given a new home and owner. I found that although I was able to measure the resistance of a selection of resistors correctly the bridge was inaccurate on all the capacitance ranges. 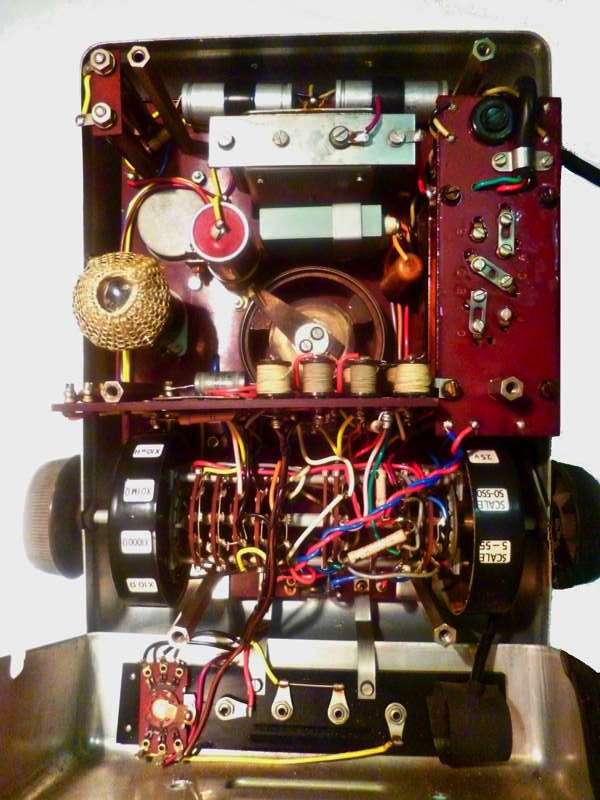 This was because the standard 0.5 mFd was low because the wax covered capacitor in parallel with the grey metal cased item in the centre of the picture above seemed to be virtually open circuit. After replacing this to bring the capacitance back up to the correct value the bridge worked well though I found difficulty in finding good nulls when checking inductors.